ANGLER'S MAIL print magazine is a must-read this week, with the nation's very best Where To Fish section certain to inspire you on your next session. The Mail's Where To Fish pages are complied only by genuine local experts who really know their regions. 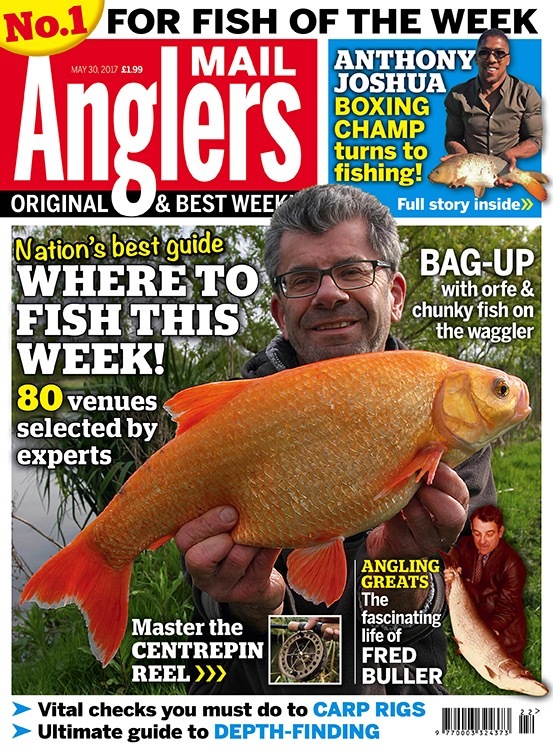 Cover star Kevin Charman, brother of Mail columnist Duncan Charman, shares top float tactics for quality fish... read all about it inside. And this week's print issue sees match star Darren Cox reveal his fishing station secrets... to make you a more efficient angler! • Walthamstow carp deaths probed. • Boxing champ Anthony Joshua and other stars. • Steve Collett shares his stealthy carp and tench tips. • John Bailey hits the bullseye with big bream. • Secret Lives talks fish and eyelids, with Dr Ian Welch. • Essential carp rig checks. Are you making them?